Nail fungus is a widespread condition that can be difficult and expensive to cure. Many people turn to over-the-counter treatments that come in the form of soaps, soaks, solutions, and creams to try to improve the symptoms that occur along with fungal infections. If you catch your infection relatively early, or you have a mild case, you may be able to get good results using over the counter products. We have compiled a list of the top OTC and natural products that can be applied directly to the nail and surrounding skin to help treat cases of nail fungus. Purely Northwest have put together this kit that has a 3 step system to help get rid of nail fungus. 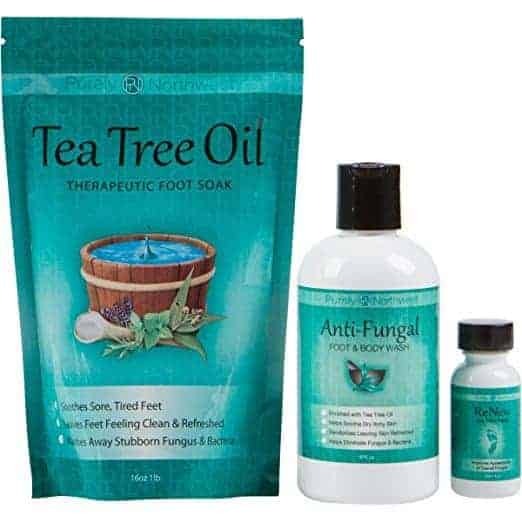 It includes an antifungal soap to help scrub and wash away dead skin and nail, a tea tree foot soak that soothes itching and burning, and a ReNew Nail Solution that has tea tree and oregano oil. Since nail fungus can be so challenging to treat, it is a good idea to try to attack the fungal infection in a few different ways, and this is a useful way to do that. Tea tree oil is a common natural ingredient that has strong antifungal and antibacterial properties with clinical studies to back up its effectiveness. Fungus Stop, from the company Zane Hellas, is an antifungal nail solution that claims to have been clinically proven to work against 99.9% of nail fungus. It also claims to start to be effective in as little as four weeks. The main ingredient is Carvacrol, that is found in in oregano oil. Carvacrol is known for having powerful antifungal properties that can help improve the appearance and color of infected nails in a relatively short period. Zane Hellas also sell a pure oil of oregano that is also used by many people to help with fungal infections; you can find that here. Yoffee Clear Advanced Nail Fungus Solution is another effective solution that uses tea tree oil to help eliminate the fungus from your nails, prevent the recurrence of infection and to stop the spread to other toes. It is made in Israel and is okay for use on people with diabetes. The company claims you may start to see visible improvements in 2 – 4 weeks. 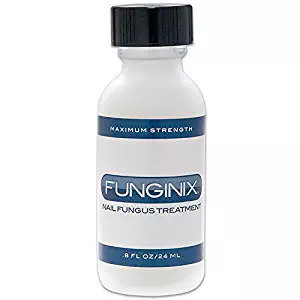 Funginix uses the main active ingredient of 10% undecylenic acid along with the herbal remedy camphor and tea tree oil. It has quite a lengthy list of natural ingredients. 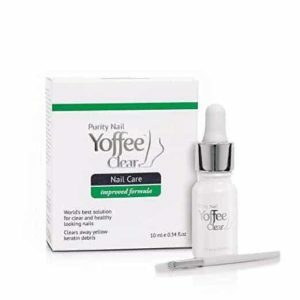 This formula helps to get rid of the infection in the nail bed as some of its elements help it to soak into the nail. The company is pretty confident in their product and offer a 100% money back guarantee if you find that it doesn’t work for you. Pur360 Manuka Oil is a kind of a multi-purpose oil that happens to work well for fungal infection since it is an antifungal, as well as being an antiseptic and anti-inflammatory. You may have already heard of Manuka Honey, that people love to use for all kinds of different ailments. Manuka oil is a little different than the honey. The honey comes from the flowers of the Manuka tree that the bees gather, while the oil comes from the leaves of the Manuka tree. The oil is much stronger. You rub this oil into the nail and the skin around the nail twice a day. It doesn’t work for everyone, but a fair number of people have been getting good results with it. It is a tad pricey, but anything related to the Manuka tree tends to be relatively expensive. Some users dislike the odor of the oil, so you may want to keep that in mind if you are sensitive to strong smells. When you are trying to treat any foot fungus an excellent place to start is with an antifungal soap. There are a few options around, but one that is often recommended by podiatrists is Pedifix’s Fungasoap. It is a soap that is made in Vermont that contains coconut oil, olive oil, jojoba seed oil, peppermint oil, tea tree oil, guar gum, glycerin, aloe, rosemary extract, and iron oxides. You will want to use this in combination with other treatments, or once an infection has cleared up, it can be used as a preventive measure to help stop future infections. It is a reasonably economical option compared to other available products. Fungasoap has a very fresh and minty smell that doesn’t hang around for too long after using. You will probably want to use Fungasoap with a nail brush (make sure you clean and disinfect the nail brush daily). Follow the recommended treatment times pretty carefully. If you don’t use the product and follow the treatment schedule, you won’t be successful. Keep your nails free from anything that may stop the cream, oil, or soaps from getting to the fungus, which includes nail polish. Remove debris from the nail, so you have the most chance of the product absorbing. Many of the products also recommend that you file down any discolored nails, so the treatment can get to where the fungus is hiding. Keep everything clean. Toenail fungus is contagious, so you need to be super clean when you are trying to get rid of it. You should also wear clean socks every day, and you may want to consider treating your shoes with an antifungal spray. Anything else that touches your feet should also be cleaned and disinfected regularly, including clippers, scissors, towels, tubs you are using for soaks, bed sheets, shower, bath, and bath mats. You can use hot soapy water, rubbing alcohol, bleach, vinegar or antibacterial cleaners to clean these types of items. Also wash your hands, especially under your nails after you have been touching your feet. Tea Tree Oil– You probably have already heard about tea tree oil, but you may be a little skeptical about its effectiveness. It is a powerful antifungal, antibacterial and antiseptic oil that comes from the leaves of Australia’s Melaleuca alternifolia plant. There have been clinical trials done on the oil that in some cases has found it to be as effective as clotrimazole (Lotrimin) for treating fungus on the nail. It’s one of the best natural ingredients available. Oil of Oregano – Oil of oregano has been used since the ancient Greeks used it to help treat a variety of ailments. It does have some scientific studies backing up the oil’s main ingredients Carvacrol and Thymol. There has been research conducted that found the Carvacrol component can kill three types of fungi. Manuka Oil-Manuka oil is quickly gaining a reputation as an effective antifungal. Manuka oil comes from the manuka tree in New Zealand. Undecylinic Acid -Undecylinic Acid is a natural fungicide that inhibits the growth of fungus. It can be synthetically manufactured or extracted from castor oil. It is known for its anti-bacterial, anti-fungal, and antiviral properties. You can find it as an active ingredient in Emoninail, Funginix, and Zetaclear. Fungal infections are complicated and time-consuming to cure, but with a lot of patience and persistence, there are OTC and natural products that can help mild to moderate infections. The key is to be consistent with your treatments, use a multi-step approach, and to ensure that you are keeping everything very clean so there is less chance of reinfection.